New purpose-built warehouse and office building. The building comprises 6,000 sq. 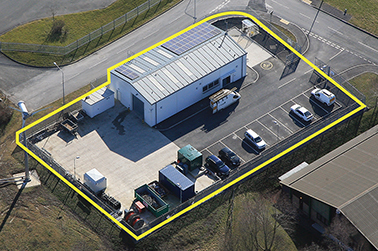 ft. on a site area of 0.75 acres and included car parking and a significant secure yard area. The site is located on the Ddole Enterprise Park and was acquired by CPG from the Welsh Assembly Government. The building was financed and constructed by CPG. The building secured a BREEAM ‘excellent’ rating of 76.06% and also won the BREEAM Industrial Category Award for Wales 2010. This award recognises the design and construction of the highest scoring buildings certified under BREEAM each year.